The reason why the daily Mass is the greatest event on planet earth each and every day is because it makes present to us in time and space the ever-living prayer within the heart of Jesus Christ ascended into Heaven. What is this prayer? It is the offering of Jesus to the Father of his Calvary sacrifice that is perpetuated by our Eucharistic liturgy (just as Jesus commanded it to be when he instituted the Eucharist on Holy Thursday as a memorial of his passion and death). Imagine you have your own personal priest…and that priest is able to offer on your behalf a most beautiful sacrifice to God – a sacrifice of Infinite value, a sacrifice which is a universal cause of all graces, a sacrifice containing every possible grace needed for your sanctification. How awesome would that be! And what does Hebrews 8:1 say? : – it says that we do have such a priest who is in heaven right now. And this high priest, says Hebrews, is appointed to offer gifts and sacrifices on our behalf (Hebrews 8:3) And how is this done? : – most especially through the Mass, through the Eucharistic sacrifice, through the gifts of bread and wine. And so the true priest at every Mass is Jesus. It is true that the Holy Mass is the Memorial of Christ’s sacrifice at Calvary. 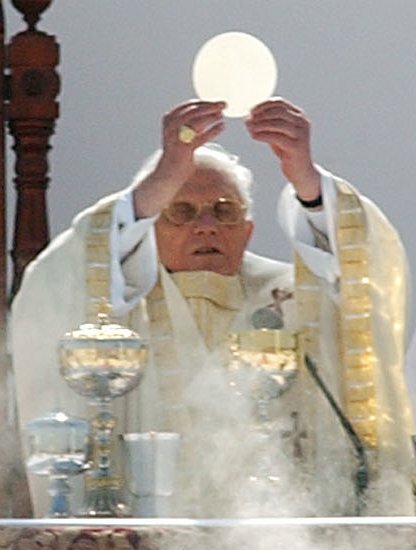 But as a memorial ceremony normally involves the remembrance of someone who is dead, the Mass is altogether unique because Jesus is alive – indeed He is Risen and Glorified! Jesus is the true Priest who celebrates each and every Mass! So when you go to Mass you are going to a liturgical gathering to pray with Jesus and to join in with Jesus to offer to the Eternal Father Jesus’ Infinite sacrifice which won our redemption. It is therefore an awesome privilege to attend Mass and to make this offering to the Father with our High Priest, Jesus, and to offer yourself to the Father in union with Jesus. In Holy Mass the sacrifice of Calvary is made present to us in a sacramental manner through the ongoing priestly ministry of Jesus Christ (see CCC 1362-1368). Indeed, there are additional powerful words in the Epistle to the Hebrews about Jesus’ ongoing priestly ministry in Heaven (words that should really give us great encouragement!). In the seventh chapter of Hebrews we read: “… because Jesus lives forever [in Heaven], he has a permanent priesthood. Therefore he is able to save completely those who come to God through him, because he always lives to intercede for them” (Hebrews 7:24-25; CCC 519). Moreover, the author of Hebrews identifies Jesus’ never-ending priesthood in Heaven as the true fulfillment of the Order of Melchizedek, the very first priesthood mentioned in the Old Testament (see Genesis 14). In fact, the Order of Melchizedek is mentioned multiple times in Hebrews! This is a very significant point for Catholics because the “thanksgiving offering” made by the priest Melchizedek in the Old Testament was that of bread and wine (Genesis 14:18), which constituted a “communion sacrifice” per Dr. Scott Hahn. Jesus is identified in Hebrews as “the mediator of a new covenant” (Hebrews 12:24). The true sacramental sign of this New Covenant is identified by Jesus as the Holy Eucharist (“This cup is the new covenant in my blood, which is poured out for you” – Luke 22:20). 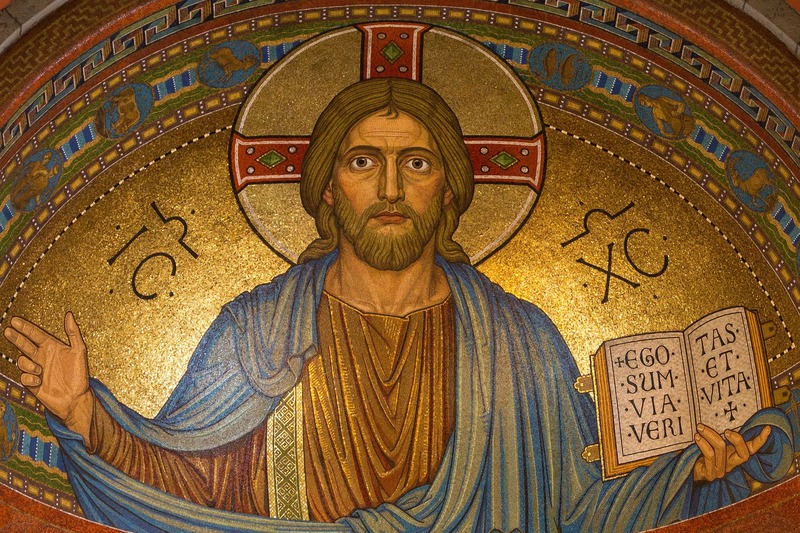 As such we are advised in Hebrews not to neglect ‘to meet together” for the New Testament liturgy (Hebrews 10:25), the Mass, of our High Priest, Jesus Christ (see CCC 692). This photo of Pope Benedict XVI celebrating Mass on May 11, 2007 was taken by Fabio Pozzebom/ABr and produced by Agência Brasil, a public Brazilian news agency. This file is licensed under the Creative CommonsAttribution 3.0 Brazil license (per Wikipedia).
. . . is present in the earthly liturgy . . . I never thought of the connection. Of course this makes great sense. Thanks for the “ah ha” moment.